These are strange times, these days of twitterstorms, shitstorms and character assassination; when reputations can be trashed, livelihoods ruined and assets vanish because of a careless turn of phrase, a boorish expression, a bum allegedly patted, an arm inappropriately touched, a knee tenderly explored, a fancy-dress costume thoughtlessly chosen. Such times call for poetry – and what better poem is there for such times than W.H. Auden's 1932 poem, The Witnesses? Auden's (1907-1973) star has faded from the days of his glory in the 1930s. He's not an easy writer to deal with: his literary output was immense; he kept meddling with existing texts throughout his life, causing much trouble for editors of his work and anthologists; some of his poetry fell out of favour with him and he removed it from his personal collections, muddying the waters even more – but such things can never be totally obliterated and eventually pop up somewhere or other. His poetry is rarely an easy read. First you have to find something you like in the gigantic mountain of his work. And then you have to understand it – which you will seldom be able to do in the conventional sense of 'understand'. 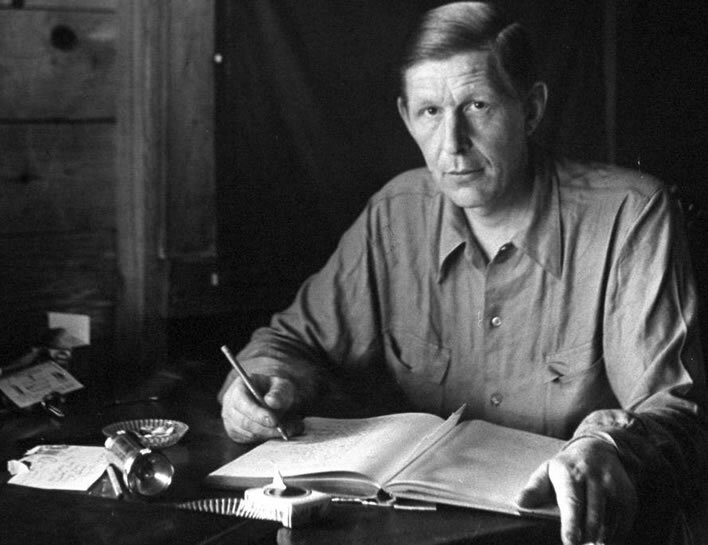 A keen student of psychological analysis, of Freud and Jung, Auden made the use of suggestion, ambiguity and enigmatic symbolism his poetic trademark. Whilst Eliot was postulating that meaning was transferred using some 'objective correlative' – an idea which does not survive close analysis – Auden was doing just the opposite: he was writing poetry the meaning of which ultimately came from the individual reader's response to the work. Perhaps we could say that there is not much absolute meaning in Auden: his meaning is what the reader makes of it. It is therefore a pointless task hunting down allusions that 'explain' the puzzling phrases in Auden's poetry. The reader has to let these phrases work on his or her own psyche – which, when Auden is at his best, they frequently do. The most I am going to do here, therefore, is to ask the reader to listen for Auden's masterful sense of metre in The Witnesses, and to point out just a few things to think about. The basic idea of the poem seems to come from the figures in Greek mythology, the Furies, a.k.a. the Erinyes. Although there are usually considered to be three of them, their number can vary. It is therefore quite legitimate of Auden to call them 'the Two'. They were the terrifying deities who exacted revenge on the wrongdoer. As everyone knows from Ancient Greek drama, a wrongdoing could not simply be forgotten – feud and revenge passed down the generations. The Furies were female creatures who saw everything, overlooked nothing and forgave nothing. Their task was not to forgive. Sounds quite like social media, in fact. One or two other signposts to the poem that reader's might like to think about are in some brief notes at the end. Here goes. You are the town and We are the clock. And it won't be flowers. Auden, W. H. Collected Poems, Faber and Faber, 1976, 'The Witnesses' (1932), p. 73f. [The extract here is actually the second part of a poem with this title. The first part seems to have been written in 1934 and tacked on at the front of our extract. There is no discernible reason for it to be there – apart from Auden's tinkering with his own work.] Verse 7 of this poem was quoted in Figures of Speech in December 2015 apropos Schubert's Winterreise, which has a similarly enigmatic symbolical and psychological effect on the reader. the gate in the rock: the gate to the underworld (most memorably as the gates to the city of Dis in Dante's Divina Commedia, Book I, 'Inferno', Canto IX, ll. 37-99.
whirlpool, we were the reef: some might think of Odysseus navigating Scylla and Charybdis in the Homer's Odyssey, Book XII. deadly crescent: a firing squad? black removers' van: a hearse? the Scissor Man' echoing the German Der Sensenmann, 'the scythe man', i.e. 'the Grim Reaper'? Readers familiar with Richard Adams' (1920-2016) 1972 classic tale, Watership Down, may recall that stanzas 6 and 7 of The Witnesses prefaced Chapter 17, 'The Shining Wire'. Chapter 17 describes the warren of the Cowslip rabbits, which was carefully managed by men. The rabbits were 'harvested' from time to time in wire snares. The rabbits of this colony had learned to live with this state of affairs – losing some of their number in exchange for good food and the hope that they won't be the next ones to die. There is a moral in there somewhere.